Holt-Oram syndrome (HOS) (OMIM 142900) is a heart–upper limb malformation complex with an autosomal dominant inheritance and near-complete penetrance but variable expression. Holt and Oram first described this syndrome in 1960. Approximately 40% of cases represent new mutations. See the image below depicting Holt-Oram syndrome in an infant. Photograph showing hypoplastic right thumb of the right hand of a 6-month-old infant with Holt-Oram syndrome. 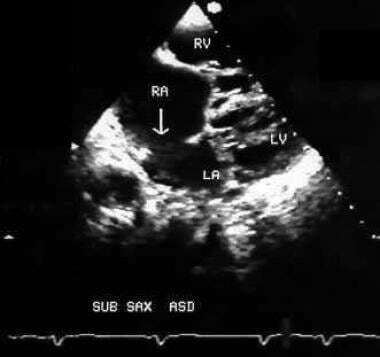 A 2-dimensional echocardiographic picture taken from subxiphoid window showing a large secundum atrial septal defect (arrow) in a 7-year-old boy with Holt-Oram syndrome. ASD = Atrial septal defect; RA = Right atrium; RV = Right ventricle; LA = Left atrium; LV = Left ventricle. A cardiomelic developmental field has also been postulated to relate the genetic heterogeneity of HOS (and other similar syndromes) to a cascade of molecules, including the brachyury, sonic hedgehog, bone morphogenetic protein, retinoic acid receptor, and transforming growth factor beta families. Disturbed fetal limb muscle development has also been reported and may underlie the bony malformations. The incidence rate of Holt Oram syndrome (HOS) is unknown. No valid racial data are available. Both sexes are equally affected, although the defects tend to be more severe in females. HOS malformations are present at birth. Age at presentation varies according to the extent of the abnormality externally visible and the type of associated heart defect, if any. Prognosis in patients with Holt-Oram syndrome (HOS) is dictated by the severity and type of cardiac and limb malformations. Because the most common defect in HOS is atrial septal defect (ASD), the prognosis is excellent. A scoring system to assess severity has been recommended by Gall et al and modified by Gladstone and Sybert. This information is provided in the Presentation section. No valid figures are available because the condition, in and of itself, has no specific mortality or morbidity. The mortality and morbidity relate directly to the associated congenital abnormalities, particularly those of the heart. For example, mortality and morbidity of a secundum atrial septal defect (ASD) is negligible throughout childhood, including patients who undergo procedures to close the ASD. Please see the appropriate respective articles for mortality and morbidity figures on specific cardiac defects. Causes of death include cardiac malformation and heart block. See the respective article for each cardiac abnormality for a discussion of cause of death. Complications secondary to heart disease and heart failure include tachyarrhythmia, especially atrial fibrillation [10, 11] and conduction abnormalities place patients at special risk during anesthetic procedures. Psychological problems may arise secondary to disability. In any child with atrial septal defect (ASD), the patient and parents should be carefully examined for limb malformations, and a family history should be studied in detail. Detection of subtle limb defect alters the recurrence risk in offspring from the empirical risk of an isolated ASD (3%) to that for an autosomal dominant trait (50%). Patient should avoid any activity beyond tolerance as well as avoid postures that might lead to deformities. Prospective parents should be alerted to the fact that a child born with Holt-Oram syndrome to an affected parent has a 1 in 3 chance of having a severe reduction abnormality of the upper limb, with a 1 in 22 risk of phocomelia. If an ASD is present, the risk of serious limb abnormality is greater than if a VSD or conduction defect occurs alone. Severity is likely to be greater if the transmitting parent is female. The detection of a severe reduction defect before or after birth indicates a high probability of an associated structural cardiac lesion. Garavelli L, De Brasi D, Verri R, Guareschi E, Cariola F, Melis D, et al. Holt-Oram syndrome associated with anomalies of the feet. Am J Med Genet A. 2008 May 1. 146A(9):1185-9. [Medline]. Al-Qattan MM, Abou Al-Shaar H. Molecular basis of the clinical features of Holt-Oram syndrome resulting from missense and extended protein mutations of the TBX5 gene as well as TBX5 intragenic duplications. Gene. 2015 Apr 15. 560 (2):129-36. [Medline]. Postma AV, van de Meerakker JB, Mathijssen IB, et al. A gain-of-function TBX5 mutation is associated with atypical Holt-Oram syndrome and paroxysmal atrial fibrillation. Circ Res. 2008 Jun 6. 102(11):1433-42. [Medline]. Bohm J, Heinritz W, Craig A, et al. Functional analysis of the novel TBX5 c.1333delC mutation resulting in an extended TBX5 protein. BMC Med Genet. 2008 Oct 1. 9:88. [Medline]. [Full Text]. Ogur G, Gul D, Lenk MK, Imirzalioglu N, Alpay F, Ogur E. Variable clinical expression of Holt-Oram syndrome in three generations. Turk J Pediatr. 1998 Oct-Dec. 40(4):613-8. [Medline]. Cachat F, Rapatsalahy A, Sekarski N, Hurni M, von Segesser L, Payot M. [Three different types of atrial septal defects in the same family]. Arch Mal Coeur Vaiss. 1999 May. 92(5):667-9. [Medline]. D Franklin A, Lorinc AN, Donahue BS. Malignant Hyperthermia-Like Manifestations in a Two-Month-Old Child with Holt-Oram Syndrome Undergoing Cardiac Surgery. J Cardiothorac Vasc Anesth. 2013 Sep 5. [Medline]. Barisic I, Boban L, Greenlees R, et al. Holt Oram syndrome: a registry-based study in Europe. Orphanet J Rare Dis. 2014 Oct 25. 9:156. [Medline]. Goldfarb CA, Wall L, Manske PR, et al. Radial longitudinal deficiency: the incidence of associated medical and musculoskeletal conditions. J Hand Surg [Am]. 2006 Sep. 31(7):1176-82. [Medline]. Postma AV, van de Meerakker JB, Mathijssen IB, Barnett P, Christoffels VM, Ilgun A, et al. A gain-of-function TBX5 mutation is associated with atypical Holt-Oram syndrome and paroxysmal atrial fibrillation. Circ Res. 2008 Jun 6. 102(11):1433-42. [Medline]. Chryssostomidis G, Kanakis M, Fotiadou V, et al. Diversity of congenital cardiac defects and skeletal deformities associated with the Holt-Oram syndrome. Int J Surg Case Rep. 2014. 5 (7):389-92. [Medline]. Jhang WK, Lee BH, Kim GH, Lee JO, Yoo HW. Clinical and molecular characterisation of Holt-Oram syndrome focusing on cardiac manifestations. Cardiol Young. 2015 Aug. 25 (6):1093-8. [Medline]. Mglinets VA. [Hand dermatoglyphics in patients with isolated triphalangia and Holt-Oram syndrome]. Genetika. 1995 Aug. 31(8):1147-53. [Medline]. Tseng YR, Su YN, Lu FL, et al. Holt-Oram syndrome with right lung agenesis caused by a de novo mutation in the TBX5 gene. Am J Med Genet A. 2007 May 1. 143A(9):1012-4. [Medline]. Smets K, Mortier G, Zecic A. Perinatal/neonatal case presentation: unexpected severe respiratory insufficiency in a newborn with Holt-Oram Syndrome. J Perinatol. 2005 Nov. 25(11):745-6. [Medline]. Allanson JE, Newbury-Ecob RA. Holt-Oram syndrome: is there a "face"?. Am J Med Genet A. 2003 May 1. 118(4):314-8. [Medline]. Basson CT, Cowley GS, Solomon SD, et al. The clinical and genetic spectrum of the Holt-Oram syndrome (heart-hand syndrome). N Engl J Med. 1994 Mar 31. 330(13):885-91. [Medline]. [Full Text]. Basson CT, Huang T, Lin RC, Bachinsky DR, Weremowicz S, Vaglio A, et al. Different TBX5 interactions in heart and limb defined by Holt-Oram syndrome mutations. Proc Natl Acad Sci U S A. 1999 Mar 16. 96(6):2919-24. [Medline]. [Full Text]. Basson CT, Solomon SD, Weissman B, et al. Genetic heterogeneity of heart-hand syndromes. Circulation. 1995 Mar 1. 91(5):1326-9. [Medline]. [Full Text]. Benson DW, Basson CT, MacRae CA. New understandings in the genetics of congenital heart disease. Curr Opin Pediatr. 1996 Oct. 8(5):505-11. [Medline]. Bohm M. Holt-Oram syndrome. Circulation. 1998 Dec 8. 98(23):2636-7. [Medline]. [Full Text]. Borozdin W, Bravo Ferrer Acosta AM, Bamshad MJ, et al. Expanding the spectrum of TBX5 mutations in Holt-Oram syndrome: detection of two intragenic deletions by quantitative real time PCR, and report of eight novel point mutations. Hum Mutat. 2006 Sep. 27(9):975-6. [Medline]. Borozdin W, Bravo-Ferrer Acosta AM, Seemanova E, et al. Contiguous hemizygous deletion of TBX5, TBX3, and RBM19 resulting in a combined phenotype of Holt-Oram and ulnar-mammary syndromes. Am J Med Genet A. 2006 Sep 1. 140(17):1880-6. [Medline]. Bossert T, Walther T, Gummert J, et al. Cardiac malformations associated with the Holt-Oram syndrome--report on a family and review of the literature. Thorac Cardiovasc Surg. 2002 Oct. 50(5):312-4. [Medline]. Brassington AM, Sung SS, Toydemir RM, Le T, Roeder AD, Rutherford AE, et al. Expressivity of Holt-Oram syndrome is not predicted by TBX5 genotype. Am J Hum Genet. 2003 Jul. 73(1):74-85. [Medline]. [Full Text]. Brockhoff CJ, Kober H, Tsilimingas N, et al. Holt-Oram syndrome. Circulation. 1999 Mar 16. 99(10):1395-6. [Medline]. [Full Text]. Bruneau BG, Logan M, Davis N, et al. Chamber-specific cardiac expression of Tbx5 and heart defects in Holt-Oram syndrome. Dev Biol. 1999 Jul 1. 211(1):100-8. [Medline]. Cheng TO. Persistent left superior vena cava in Holt-Oram syndrome. Int J Cardiol. 2000 Oct. 76(1):83, 81-2. [Medline]. DuPre CT, Fincher RM. Holt-Oram syndrome associated with hypoplastic peripheral vasculature and midsystolic click. South Med J. 1993 Apr. 86(4):453-6. [Medline]. Ekure EN, Okoromah CN, Briggs E, Ajenifuja OA. Holt-Oram syndrome with hypoplastic left heart syndrome in an African child. Niger Postgrad Med J. 2004 Sep. 11(3):190-2. [Medline]. Fan C, Liu M, Wang Q. Functional analysis of TBX5 missense mutations associated with Holt-Oram syndrome. J Biol Chem. 2003 Mar 7. 278(10):8780-5. [Medline]. [Full Text]. Gruenauer-Kloevekorn C, Reichel MB, Duncker GI, Froster UG. Molecular genetic and ocular findings in patients with holt-oram syndrome. Ophthalmic Genet. 2005 Mar. 26(1):1-8. [Medline]. Hatcher CJ, Kim MS, Mah CS, et al. TBX5 transcription factor regulates cell proliferation during cardiogenesis. Dev Biol. 2001 Feb 15. 230(2):177-88. [Medline]. He J, McDermott DA, Song Y, et al. Preimplantation genetic diagnosis of human congenital heart malformation and Holt-Oram syndrome. Am J Med Genet A. 2004 Apr 1. 126(1):93-8. Heinritz W, Moschik A, Kujat A, et al. Identification of new mutations in the TBX5 gene in patients with Holt-Oram syndrome. Heart. 2005 Mar. 91(3):383-4. [Medline]. [Full Text]. Heinritz W, Shou L, Moschik A, Froster UG. The human TBX5 gene mutation database. Hum Mutat. 2005 Oct. 26(4):397. [Medline]. Horb ME, Thomsen GH. Tbx5 is essential for heart development. Development. 1999 Apr. 126(8):1739-51. [Medline]. [Full Text]. Hurst JA, Hall CM, Baraitser M. The Holt-Oram syndrome. J Med Genet. 1991 Jun. 28(6):406-10. [Medline]. Keller BB. Developmental structure-function insights from Tbx5(del/+) mouse model of Holt-Oram syndrome. Am J Physiol Heart Circ Physiol. 2005 Sep. 289(3):H975-6. [Medline]. [Full Text]. Kohlhase J, Chitayat D, Kotzot D, et al. SALL4 mutations in Okihiro syndrome (Duane-radial ray syndrome), acro-renal-ocular syndrome, and related disorders. Hum Mutat. 2005 Sep. 26(3):176-83. [Medline]. Koishizawa T, Hayashi N, Tadokoro M, et al. [A case report of the radical correction of a truncus arteriosus and peripheral pulmonary stenosis in association with Holt-Oram syndrome]. Kyobu Geka. 1995 Feb. 48(2):133-6. [Medline]. Koutlas ED, Papageorgiou AA, Athyros VG. Holt-Oram syndrome with malformations of renal and cerebral arteries. Acta Cardiol. 1996. 51(4):373-6. [Medline]. Le Meur N, Goldenberg A, Michel-Adde C, et al. Molecular characterization of a 14q deletion in a boy with features of Holt-Oram syndrome. Am J Med Genet A. 2005 May 1. 134(4):439-42. [Medline]. Lee ML, Tsao LY, Wang YM. Interventional cardiac catheterization for the coarctation of the aortic arch and patent ductus arteriosus in a 3-day-old neonate with the Holt-Oram syndrome. Int J Cardiol. 2005 Jun 8. 101(3):503-5. [Medline]. Lehner R, Goharkhay N, Tringler B, et al. Pedigree analysis and descriptive investigation of three classic phenotypes associated with Holt-Oram syndrome. J Reprod Med. 2003 Mar. 48(3):153-9. [Medline]. McDermott DA, Bressan MC, He J, et al. TBX5 genetic testing validates strict clinical criteria for Holt-Oram syndrome. Pediatr Res. 2005 Nov. 58(5):981-6. [Full Text]. McDermott DA, He J, Song YS, et al. Update: PGD and Holt-Oram syndrome. Am J Med Genet A. 2005 Jul 15. 136(2):223. [Medline]. Moskowitz IP, Pizard A, Patel VV, et al. The T-Box transcription factor Tbx5 is required for the patterning and maturation of the murine cardiac conduction system. Development. 2004 Aug. 131(16):4107-16. [Medline]. [Full Text]. Murakami M, Nakagawa M, Olson EN, Nakagawa O. A WW domain protein TAZ is a critical coactivator for TBX5, a transcription factor implicated in Holt-Oram syndrome. Proc Natl Acad Sci U S A. 2005 Dec 13. 102(50):18034-9. [Medline]. [Full Text]. Newbury-Ecob RA, Leanage R, Raeburn JA, Young ID. Holt-Oram syndrome: a clinical genetic study. J Med Genet. 1996 Apr. 33(4):300-7. [Medline]. Pizard A, Burgon PG, Paul DL, Bruneau BG, Seidman CE, Seidman JG. Connexin 40, a target of transcription factor Tbx5, patterns wrist, digits, and sternum. Mol Cell Biol. 2005 Jun. 25(12):5073-83. [Medline]. [Full Text]. Plageman TF, Yutzey KE. Microarray analysis of Tbx5-induced genes expressed in the developing heart. Dev Dyn. 2006 Oct. 235(10):2868-80. [Medline]. Porsch M, Hofmeyer K, Bausenwein BS, et al. Isolation of a Drosophila T-box gene closely related to human TBX1. Gene. 1998 Jun 8. 212(2):237-48. [Medline]. Schneider MD, Schwartz RJ. Heart or hand? Unmasking the basis for specific Holt-Oram phenotypes. Proc Natl Acad Sci U S A. 1999 Mar 16. 96(6):2577-8. [Medline]. [Full Text]. Shono S, Higa K, Kumano K, Dan K. Holt-Oram syndrome. Br J Anaesth. 1998 Jun. 80(6):856-7. [Medline]. [Full Text]. Sinkovec M, Petrovic D, Volk M, Peterlin B. Familial progressive sinoatrial and atrioventricular conduction disease of adult onset with sudden death, dilated cardiomyopathy, and brachydactyly. A new type of heart-hand syndrome?. Clin Genet. 2005 Aug. 68(2):155-60. [Medline]. Terrett JA, Newbury-Ecob R, Smith NM, Li QY, Garrett C, Cox P, et al. A translocation at 12q2 refines the interval containing the Holt-Oram syndrome 1 gene. Am J Hum Genet. 1996 Dec. 59(6):1337-41. [Medline]. [Full Text]. Tucker KJ, Murphy J, Conti JB, Curtis AB. Syncope and sinus arrest associated with the upper limb-cardiovascular (Holt-Oram) syndrome. Pacing Clin Electrophysiol. 1994 Oct. 17(10):1678-80. [Medline]. Weber M, Wenz W, van Riel A, et al. [The Holt-Oram syndrome. Review of the literature and current orthopedic treatment concepts]. Z Orthop Ihre Grenzgeb. 1997 Jul-Aug. 135(4):368-75. [Medline]. Wilson GN. Correlated heart/limb anomalies in Mendelian syndromes provide evidence for a cardiomelic developmental field. Am J Med Genet. 1998 Apr 1. 76(4):297-305. [Medline]. Yi CH, Terrett JA, Li QY, et al. Identification, mapping, and phylogenomic analysis of four new human members of the T-box gene family: EOMES, TBX6, TBX18, and TBX19. Genomics. 1999 Jan 1. 55(1):10-20. [Medline]. Zaragoza MV, Lewis LE, Sun G, et al. Identification of the TBX5 transactivating domain and the nuclear localization signal. Gene. 2004 Apr 14. 330:9-18. [Medline]. Zhou YQ, Zhu Y, Bishop J, et al. Abnormal cardiac inflow patterns during postnatal development in a mouse model of Holt-Oram syndrome. Am J Physiol Heart Circ Physiol. 2005 Sep. 289(3):H992-H1001. [Medline]. [Full Text]. 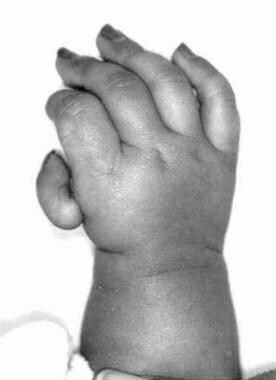 Photograph of the left hand of a 6-month-old infant with Holt-Oram syndrome showing total aplasia of the left thumb. Plain radiograph of the right forearm and hand of a 5-month-old infant with Holt-Oram syndrome showing hypoplastic radius and ulna and only 4 metacarpals. Color Doppler echocardiographic picture taken from subxiphoid window showing the large left-to-right flow of blood (arrow) across the atrial septal defect. The red color pattern depicts flow direction from left atrium (LA) to right atrium (RA). ASD = Atrial septal defect; RA = Right atrium; RV = Right ventricle; LA = Left atrium; LV = Left ventricle.